"Everything flows," is placed on the lips of the Greek philosopher Heraclitus. From a purely visual point of view, this is not entirely true. After all, there are solid materials. When it comes to the unique properties of plastics, for example, formulations with highly cross-linked molecular structures and stabilizers, colors, and additives are in demand. The aim is to make plastics gas-tight (beverage bottles), resistant to solvents (petrol tanks), or hard and resistant (car bodies). A possible analysis method in the development of suitable structure-property-relationships is dynamic-mechanical analysis (DMA). A solid sample is bent, twisted, or compressed under varying temperatures to determine the mechanical behavior under different conditions. With the new MCR 702 MultiDrive, Anton Paar launched a device on June 12 that offers these analytical capabilities to plastics developers. 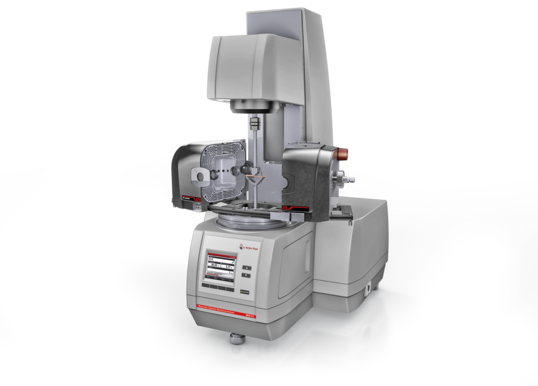 The MCR 702 MultiDrive is a further development of the top rheometer MCR 702 TwinDrive from Anton Paar. While the MCR 702 TwinDrive is equipped with rotary motors at the top and bottom, which, according to product specialist Alexander Klutz, enables liquid, gel and conditionally solid samples to be analyzed, in the new MCR 702 MultiDrive, a linear motor is used at the bottom to linearly compress, bend, and stretch a sample, which is not possible with rotary motors. The device achieves a maximum stroke of 9.4 mm, while the minimum deflection is in the lower nanometer range, says product specialist Klutz. Despite this high-precision position control, the MCR 702 MultiDrive can achieve forces up to 40 N. This is remarkable for the linear motor controlled by magnetic fields, considering that the downward force of an object weighing one kilogram is almost 10 Newton. In combination with the CTD 600 MDR temperature chamber as an accessory, this new instrument concept offers an all-around analysis of solids from -150 to 350 °C with conclusions on flexural, torsional, tensile, and compression behavior. The MCR 702 MultiDrive is the only device on the market that combines a fully-fledged dynamic-mechanical analysis with the functional range of a high-end rheometer. In addition to established features such as automatic recognition of the measuring systems, the measuring device also offers innovations such as automatic positioning for optimum alignment. For those who already own an MCR 702 TwinDrive or MCR 502 TDR, these instruments are easy to upgrade to a MultiDrive system. The lower motor can be simply substituted. "With the MCR 702 TwinDrives or MCR 502 TDRs already delivered, only the CPU needs to be replaced, and a firmware update carried out", informs product manager Gunther Arnold. The target groups for the MCR 702 MultiDrive are the polymer industry and academic institutions in the field of plastics research. Anton Paar has a market share of more than 35% in the rheology sector and is thus the world market leader. Plato has finally expanded Heraclitus' quote on "everything moves on, and nothing remains." The MCR 702 MultiDrive confirms the progress concealed in that quotation about constant development and change; and that philosophy and technology complement each other well.